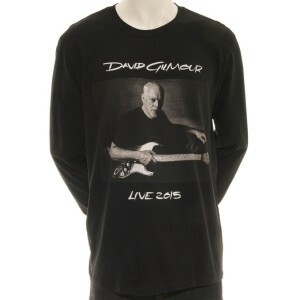 Long sleeve black t-shirt with David Gilmour logo and photograph of Gilmour with his guitar. Hey hey all! Got the long sleeve in a timely manner. Always great to get some Gilmour wear! Just wish I could get one of his guitars from the auction in June!! Whoa!! I would settle for just a single guitar pick from Mr. Gilmour! Lol. Thanks for the great service as always. Have a great day!! Rock on! Ronnie G Cibolo, Texas . Great shirt! Cool graphics and is comfortable.